Home Magazine Expert Advice [Sponsored] Download Clues to Avoid Expensive Repairs on a Philips IU22 or IE33 Ultrasound Machine. Most imaging professionals know that a typical service event on a Philips IU22 or IE33 ultrasound machine tends to fall into one of four categories: PM, image artifact, hard down or mechanical problem. Each of these events requires the expertise of an imaging service professional. 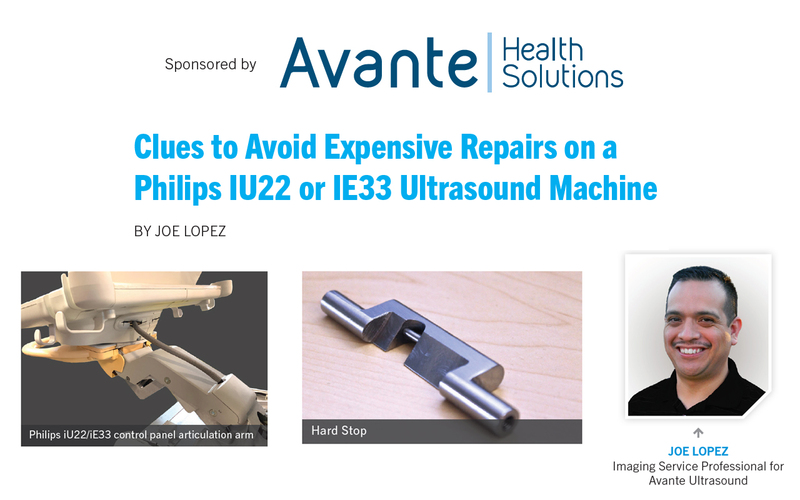 Avante Ultrasound provided TechNation magazine with Clues to Avoid Expensive Repairs on a Philips IU22 or IE33 Ultrasound Machine. You can download a copy of this Expert Article installation by submitting the form below. And, stay tuned to TechNation for quarterly updates from Avante Health Solutions.